1. Define “fishing expedition” as depicted in this cartoon. 2. One type of humor editorial cartoonists use is irony. Irony is defined as when the opposite of what you expect to happen occurs. Describe the irony of this cartoon. 2. The DOJ has been on a fishing expedition to get Trump; instead it appears they may have caught themselves. 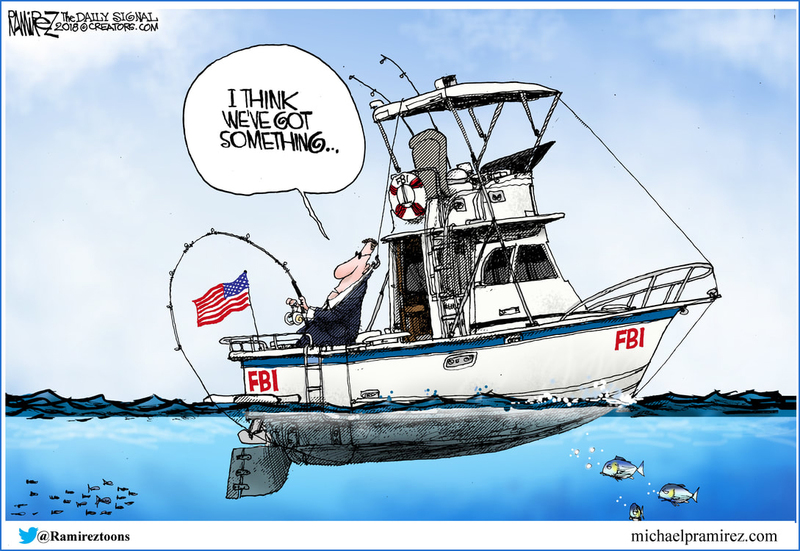 It has been said that former FBI Director (and now DOJ special counsel) Robert Mueller has been on a “fishing expedition” to find something — anything — that could take down President Trump. In the latest news, it is now possible that what has been caught is the FBI’s surveillance of the Trump campaign before the 2016 election.